Smartwatches are just beginning to emerge as the newest touchscreen gadgets. Just like MP3 players, phones, and tablets before them, smartwatches will soon be carried around by basically everyone. 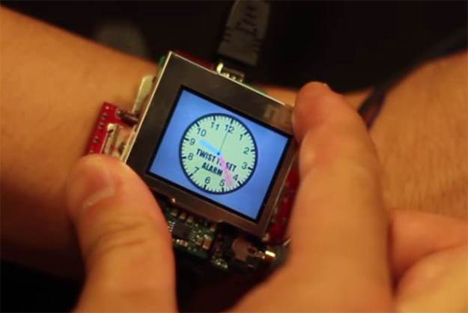 Carnegie Mellon University’s Future Interfaces Group is working on a prototype smartwatch that incorporates a whole new dimension of interaction. Instead of relying just on a touchscreen to make the magic happen, FIG’s version will use gestures like panning, twisting, tilting and clicking to perform various functions. The revolutionary interface will allow users to interact with the device without blocking the screen with their fingers, which is a common problem with current small touchscreen devices like existing smartwatches. The gestures are more or less intuitive for people who have been using touchscreen devices already. In the music app, you pan left or right (by moving the watch face in the appropriate direction) to scroll through the music selection. 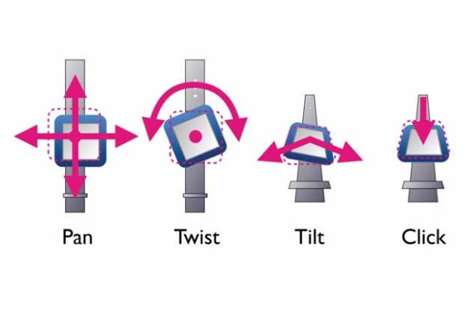 For games, twisting, tilting and panning could all be used to control the gaming action. There are also novel applications that we don’t typically see on touchscreen devices, such as a clock app that switches to alarm clock mode when clicked (i.e. pressed down). Twisting the watch face to the left or right lets you set the alarm time. In future versions of the smartwatch, the researchers hope to add even more layers of gesture input for greater freedom no matter what you want to do with the watch.